Date of Wisaal: 6th of Rajab 627 A.H. / 16th March 1236 A.D. Resting at: Ajmer, Rajasthan, India. Khwaja Moinuddin Chisty‎ رحمتہ اللہ علیہ was born in Seistan (East Persia) also known as Sejistan, around 537 Hijri in a respected family. His father Khwaja Ghayasuddin‎ رحمتہ اللہ علیہ and mother Syeda Bibi Ummalwara alias Bibi Mahe-Noor‎ رحمتہ اللہ علیہ were the descendants of Hazrat Ali رضي الله عنه through his sons Imam Hassan رضي الله عنه and Imam Hussain رضي الله عنه, Khwaja Saheb lost both his Father and Mother at an early age of sixteen years. He inherited an orchard and a wind mill which serve as his means of livelihood. One day when Khwaja Saheb was working in his orchard, a pious dervish and Majzoob, Ebrahim Qandoozi‎ رحمتہ اللہ علیہ, came and took his seat under the shade of a tree. When Khwaja Saheb saw him, he brought a bunch of grapes and presented it to his guest. The visitor ate those grapes and was delighted, and took something out of his bag, chewed it, and then offered it to his young host. Khwaja Saheb ate it without any hesitation, and at once the light of wisdom and knowledge dawned upon the young Khwaja. Thereafter he disposed of all his worldly belongings, and distributed the money amongst the poor. Having thus broken all the ties with worldly affairs, he started for Samarqand and Bukhra, then the great centers of learning for acquiring religious education and knowledge. When Khwaja Saheb had acquired the best knowledge and wisdom of the time, he traveled widely in search of a pir (Spiritual guide) who could provide him the best spiritual guidance. He came to know of Hazrat Khwaja Usman Haruni‎ رحمتہ اللہ علیہ who was the greatest scholar and unrivalled spiritual guide of that period. In the very first meeting Khwaja Saheb completely submitted himself to his Murshid and remained in the company of this great divine spiritual leader for twenty years and served him devotedly, passing through the various stages of the spiritual life. Thus the great Murshid trained and elevated Khwaja Saheb to the highest spiritual attainments. As the great Khwaja became accomplished and perfect in every respect, the divine tutor honoured him with his robe and took him to HAJ. Both, then proceeded to Makkah and performed the HAJJ, and then went to MADINA and stayed there for some time, to get the blessings of The Prophet of Islam (صلى الله عليه وسلم) . One night in a trance, he was ordered by The Holy Prophet (صلى الله عليه وسلم). 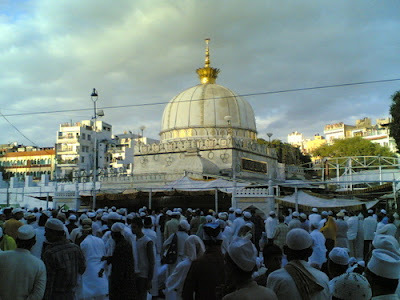 Hazrat Khwaja Moinuddin Chisty‎ رحمتہ اللہ علیہ arrived in AJMER at the age of 52 years around 587 A.H./1190 A.D., on his divine mission, unique in the annals of Islam. His only Armour for the success of his great mission was the greatest "invisible power" the pervades and sustains the whole universe. At that time Ajmer was ruled by Prithvi Raj Chauhan, the famous Rajput king. In his court, he had a large number of powerful magicians with Ajai Pal as their leader. Khwaja Saheb stayed at a hill close to Ana Sagar lake. Now known as the Chilla Khwaja Saheb. When news spread, that a very pious Dervish had come to Ajmer people began to flock to him in increasing number. Whosoever came to him, received the kindest treatment and blessing and simplicity that they began to embrace Islam. Many became his disciples. Even Ajai Pal submitted himself to the divine powers of Khwaja Saheb, gave up all his magic and became his disciple. While this was going on at Ajmer Shahabuddin Ghori again attacked India, in 1192 A.D. and in the famous battle of Tarain defeated Prithvi Raj. When Shahabuddin Ghori came to know of the presence of Khwaja Saheb at Ajmer, he personally came to see him at his place, and enjoyed the grace of his meeting. Khwaja Saheb continued his noble and magnificent mission, showing the path of truth to the people. He also sent his disciples and successors to different parts of country who too served the people and preached the tenants of Islam. 1.) Hazrat Khwaja Qutubuddin Bakhtiar Kaki‎ رحمتہ اللہ علیہ (Delhi ob. 1236). 2.) Hazrat Shaikh Fariduddin Ganjshker‎ رحمتہ اللہ علیہ (Pak Pattan ob. 1265). 3.) Hazrat Shaikh Nizamuddin Aulia‎ رحمتہ اللہ علیہ (Delhi ob. 1325). 4.) Hazrat Shaikh Nasiruddin Chirage Dehlvi‎ رحمتہ اللہ علیہ (Delhi ob. 1356). At the age of 50 years, when he was almost settled in Ajmer and the preachings were on the top, he dreamt of Prophet Mohammed (صلى الله عليه وسلم) who said, "O Moinuddin! You have been very active in obeying ALLAH's orders but why didn't you follow my Sunnat." Thus, Khwaja Sahib‎ رحمتہ اللہ علیہ made two marraiges one after another. In those days a Saint Wajihuddin Mash-hadi‎ رحمتہ اللہ علیہ was staying in Ajmer. One night he saw Imam Jafer Sadiq رضي الله عنه in dream, who quoted Prophet Mohammed (صلى الله عليه وسلم) as saying to give his daughter in marriage to Khwaja Moinuddin Chishti‎ رحمتہ اللہ علیہ as he is one of the loving persons of ALLAH and His Prophet (صلى الله عليه وسلم). When he woke up, he was very happy. He went to Khwaja Sahib and told about his dream. Khwaja Sahib said, "Though he is on the verge of his life and has no need to marry but obedience of Prophet Mohammed (صلى الله عليه وسلم) is also necessary, so I accept the offer whole heartedly and ready for the marriage. This made Syed Sahib‎ رحمتہ اللہ علیہ very happy and he married his daughter Bibi Asmat‎ رحمتہ اللہ علیہ with him. Khwaja Sahib‎ رحمتہ اللہ علیہ also had a second marraige. Some historians write that his second wife Ummatullah‎ رحمتہ اللہ علیہ was the daughter of a Raja, who accepted Islam willingly. He was the eldest son of Khwaja Sahib‎ رحمتہ اللہ علیہ who earned his livelihood by farming in Mandal town. He was a great saint and a scholar as well . Agter twenty years of Khwaja Sahib‎ رحمتہ اللہ علیہ death he died in Sarwar town, some 40 miles away from Ajmer. His Mazar is located near a pond in the town. His Urs is celebrated on the 3rd of Shaban every year with great fervour. He was blessed with five sons. One of his sons, Hazrat Khwaja Hussamuddin‎ رحمتہ اللہ علیہ was a perfect Sufi. His grave is at Sanbar Sharif. Every year on 13 and 14 Rajab Urs is organised. He was the second son and he was a great saint, as well as possessing the quality of revelation. He made very tough exercises for self purification. At the age of 45, he disappeared from the human eyes and joined invisible religious fraternity. He was the youngest son of Khwaja Gharib Nawaz‎ رحمتہ اللہ علیہ and was a great religious person. He died. He died at the age of 50. His Mazar is on a platform near Jhalara Ghat in Ajmer Sharif. His Urs-e-Mubarak is celebrated on 13th Zil-Hijja every year. She was the only daughter of Khwaja Sahib‎ رحمتہ اللہ علیہ. She was a great religious personality. Khwaja Sahib granted her Khilafat. She guided thousands of women to the righteous path. She was married to Hazrat Shaikh Raziuddin‎ رحمتہ اللہ علیہ. He was the son of Qazi Hamiduddin Nagori‎ رحمتہ اللہ علیہ. Her Mazar-e-Mubarak is located below the Mazar of Khwaja Sahib. After achieving the objectives of his mission and complying with the command given to him by the Holy Prophet (صلى الله عليه وسلم), his noble soul left the corporeal body on the 6th of Raja 633 A.H. / 16th March 1236 at the age of 97. He was buried in the same cell (Hujrah) which was the center of his divine activities, throughout his stay at Ajmer. Today his tomb is popularly known as "Dargah Khwaja Saheb, Ajmer". People of all walks of life and faith from all over the world, irrespective of their caste, creed and beliefs visit this great shrine to offer flowers of there esteem and devotion. The rich and the poor stand side by side to pay their homage and respect to the divine soul.